Woohoo, it's Thursday! Only one more day until the week is over. I have to stash away my errant polishes today because my brother is arriving this evening and I wouldn't want him to see what I've been cookin up in the lab. I'm not sure how I accumulate so many polishes, especially when I've been trying to be on a low buy these past couple months. It made me start thinking about how prices of indies seem to be going up in price, which made me think about the most I've paid for a polish. I think $30 has been the most I've paid, and it was for a HTF aka Unicorn Pee.... What's the most that you've paid for a polish? 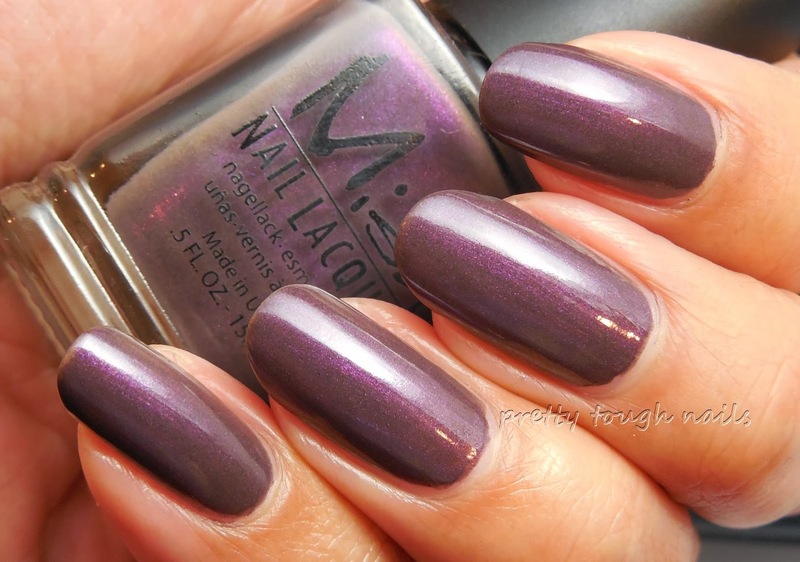 Today's post features Misa Well Heeled Grey, a beautiful purple shimmer with grey undertones. The name is misleading because it's certainly not grey, but more of a multi-faceted purple. The formula on this was excellent, with smooth application and perfect consistency. There are zero complaints here! I could only wish all my polishes were like this. In fact, I think I've already worn this three times since receiving it in December. It's a near one coater but there are two here for extra opacity. And look ma, no topcoat! FingerPaints recently released another collection of flakie topcoats, and although I haven't been wowed by the pics online, I ended up getting Abstract Attraction as my free bottle with my Sally's BOGO purchase. I decided on AA purely based on the bottle appearance, which contained flakies reflecting opalescent blue. This translated perfectly over Well Heeled Grey, but the overall effect wasn't as dramatic as I was hoping. The flakies didn't stand out as strongly as I've noticed before with the previous FP flakie collection, possibly because the flakies have a flat appearance with their monochromatic coloring. It could be due to my basecolor as well, in that it wasn't dark enough to carry off the flakies. I doubt it though, because the purple is pretty dark IRL! This is one coat over the Misa, and I had no difficulty with application or with stray flakies sticking up or off the nails. This is finished with a quick layer of topcoat. I'll have to play with the flakies some more and see if I can find a good basecolor combination for Abstract Attraction. I'm thinking a dark navy might be the best. Have you tried either of these yet, whether it be a Misa polish or a FingerPaints flakie from either collection? I love Colorful Dream! The colors really pop against the black. So funny you commented - I was looking at one of your posts the other day thinking I wanted to recreate it! It was the triangle tape mani. Gorgeous! Even though this combination might not be what you expected, it's still gorgeous! That Misa sure is pretty by itself and I like how the flakie looks on top. Still, I don't think I'll be getting anything from the collection. I just wish they were as bright and colorful as the first set. I've seen other swatches online and I think Abstract Attraction may be the dud of the group. The other ones seem much more colorful. You're right though, the first set is much better than this release.